What initially drew my attention to this place, were stories of extended tea gardens supposedly to be found here. The Google search motivated by the such inspired curiosity did not only return a confirmation of these rumours, but also information about a historical background of the place, that is most probably unprecedented, at least in Thailand: from 1976 to 1982 Ban Hin Taek served Khun Sa, the Golden Triangle’s most notorious war and drug lord and for many years America’s Public Enemy No. 1, and its Mong Tai Army as a headquarters and basis of operation, a history whose implications and impacts are significant influencing the place until today. Under the cover of the Thai sovereignity, Khun Sa, a military leader, drug dealer and diplomat likewise, did not only train his recruits here for for the battle in the Shan territories, but also used the place as his own residence, as a retreat area for his troups, and a hub for the drug trade in the Golden Triangle, in which Khun Sa, according to American DEA sources, played a significant role as an organizer and main profiteer over a period of roughly two decades. Nevertheless, decisive for my decision to pay the place a weekend visit for a more in-depth exploration of the town and area were finally still mainly the stories of said tea gardens as well as the pictures of such that I had found on the Golden Triangle (GT) Rider website. 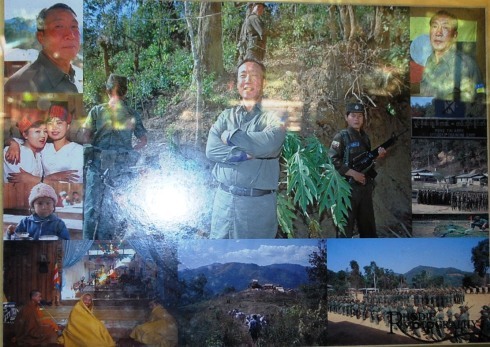 However, the background of the place itself, as well as the circumstance that my companion was a member of the aid NGO Between Borders that cooperates with Shan representatives in this area to support war victims, refugees and displaced people from the Shan territories, made sure that my perspective on this place would not remain limited to tea gardens. A question, that automatically arises for the visitor due to the omnipresent co-existence of two different town names is that for the why of this. 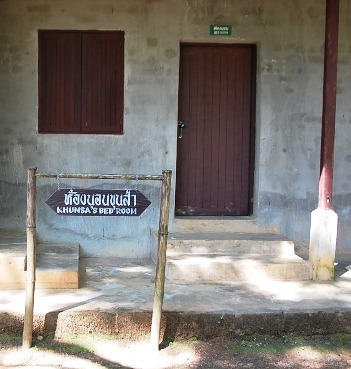 However, knowing about the story around the two different common town names for Doi Mae Salong (official Thai name: Santhikiri), I already had an idea in this regard that should prove to be correct. 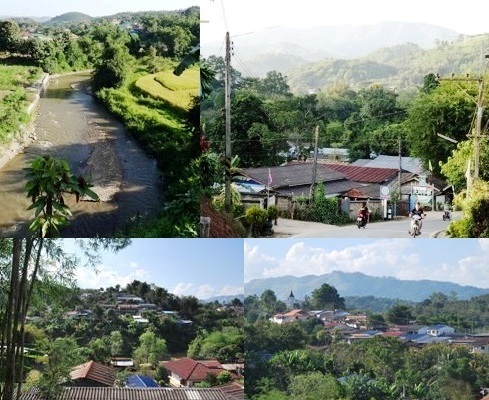 Hin Taek (= split stone, because of the split-in-two-parts large stone resting in the little river flowing through the village) is the true and original name of the settlement established by members of the Akha mountain tribe in the beginning of the 20th century, and it is the name that (as in the case of Doi Mae Salong) is still most common among the the inhabitants of the small 3000 people town and those of the surrounding villages and settlements. Therd Thai (= “to the honor of Thailand”) is the name that Thai authorities have given the place, in order to set a symbol for the end of its “separatist” past and integration with in Thailand. However, as this name did not prevail with the regional population, we will follow the vernacular and preferentially use the name “Hin Taek” in our further depiction. 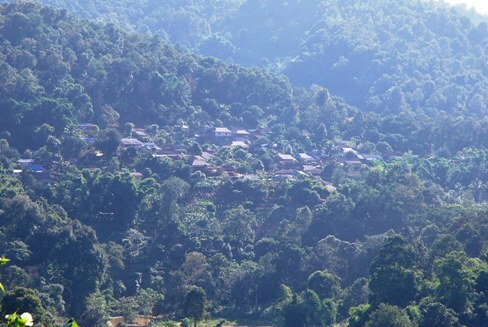 Ban Hin Taek is best accessible via the road to Doi Mae Salong from Mae Chan / Ban Pasang. The same bifurcates about 12 km before Doi Mae Salong, where you turn right in order to reach Hin Taek after 13 km on one of the most panorama-intensive stretches of north Thailand. 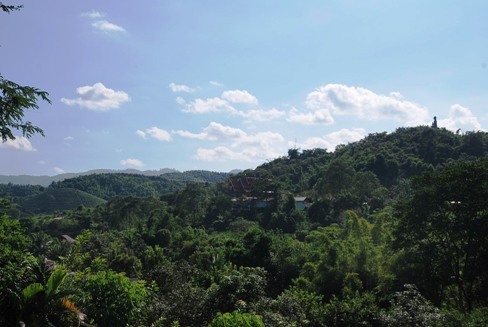 During daylight hours, you can see several dispersed settlements, the largest and most central of them being Ban Hin Taek, already kilometers before your arrival from a pass high over the Hin Taek valley. However, after the planned schedule for our journey had proven as unrealistic, we see the same only as aggregations of light points, as we have to travel the last 20km of our trip in complete darkness. This forces us to save most of the panoramic features of our journey for the way back. While according to official statistics the town itself counts only ca. 3000 inhabitants, the immediate catchment area, consisting of villages mainly inhabited by ethic Shan, Yunnan Chinese and several mountain tribes, is quantified with about the 10-fold population. 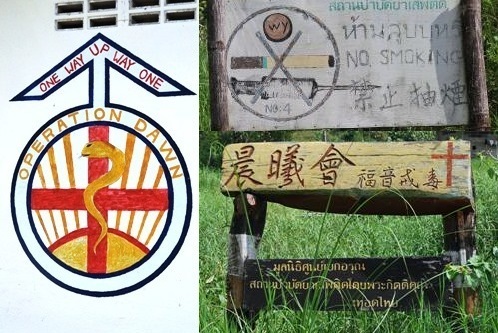 From online sources, I had heard about a local Guest House / Resort, the Rim Taan Resort, which generally seemed to enjoy a good reputation and which also was already known to my companion from Between Borders from earlier visits. The resort impresses with an idyllic river bank location situation and extremely favorable prices ($US12.00/ night) for proper bungalows, apart from the standard basic facilities (bed, WC, hot shower) offering even a certain degree of luxury (TV, wireless internet). In order to avoid negative surprises, we had reserved rooms there a few days before our arrival by phone. Still, this turns out to be at least initially not saving us from said negative surprise anyway: although the resort appears to be completely vacant, with no guest in sight and apparently no bungalow being inhabited, we are obviously classified in some category of less desirable visitors and are told that our reservation had accidentally remained unconsidered and the resort be fully booked for this night with no bungalow being left. Considering the progressed hour and darkness, I discard again my first idea driving all the way back to Doi Mae Salong and look for an accommodation there, and we decide to follow a resort employee’s vague suggestions regarding alternative accommodation options in Ban Hin Taek. This way, during the following hour we receive a comprehensible overview of all accommodation facilities of Ban Hin Taek, turning out to mainly have the character of emergency accommodation and giving us the idea that all of these might be relicts from a time, when the village predominantly served Shan fighters from the battle front as a safe harbor and retreat. My companion’s connections to said local representatives of the Shan organizations should now prove to be our saving grace: the tide turns after agreeing on the phone to meet with a Shan activist known to my companion, who promises to find us a place to sleep, at our original destination, the Rim Taan Resort. Obviously, thanks to the presence of our new guarantor, the insight prevails that after all we might in fact not be backpacker tourists on a mission to find north Thailand’s most genuine opium experience, but much rather visitors with comparably legitimate intentions, and “John”, the Shan resort operator, who seems to have undergone a 180° personality change in the meantime, welcomes us with a litany of apologies and instructs his staff to show us two bungalows. 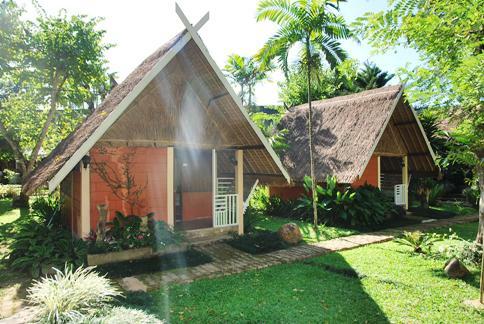 As it later shall turn out, virtually all adjacent bungalows of the resort are vacant that night. Despite the initial trouble, we altogether perceive our stay at the Rim Taan Resort as a pleasant experience: though the Guest House proves to be a kind of service desert (e.g. no breakfast or other food and significant difficulties to locate a member of the staff at times), it makes up for this deficiency with its beautiful idyllic location and the general friendliness of both the owner and staff. Problem No. 1 solved. Problem No. 2: Food intake, in this case dinner. Located right next door to the Rim Taan Resort is the Ting Ting Restaurant, also mentioned and highly recommended by our internet sources. I am pleased recognizing the red, ball-shaped paper laterns with printed dragon motifs on them seaming the restaurant’s street front, a clear indication of the Chinese identity of this culinary facility: chances are good that in the end of this day, I will still get to have my long-missed pot of tea. And lo and behold, upon request I am quickly served with an steaming hot pot of aromatic Oolong tea. My mood, slightly inclined due to the rather inhospitable welcome we initially received at our booked resort, takes a turn for the better immediately. Ordering food seems to be the harder task: the menu, obviously a list of Yunnanese dishes, only comes in Thai and Chinese language, which makes ordering a bit hard, at least for us, who have no capacities in both these written languages. Though my oral knowledge of the Thai language and the support of my companions Shan acquaintance contribute to bridging that gap, we still finally order a selection of dishes, of which we do not really know what to expect from them. We are pleasantly surprised, as “Black Chicken Yunnan style”, fried spinach and a mixed Chinese vegetables plate prove to be real delicacies. Established in 1903, Ban Hin Taek is considered the first Akha settlement on Thai soil. In fact, the Akha mountain tribe represents one of the town’s largest population groups until today. 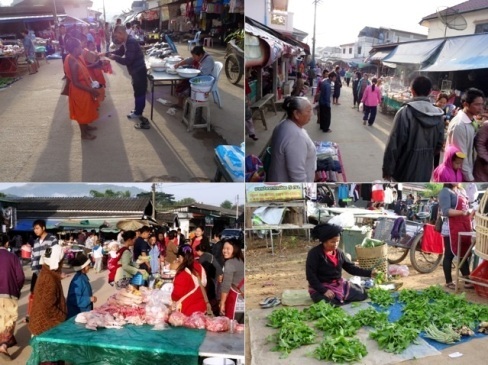 A visit to the local market and a walk through the evening Ban Hin Taek clearly reveal the ethical variety of the place: Akha and several other mountain tribes, Shan and Chinese all maintain their own cultural identities that combine here to a truly multicultural melting pot. 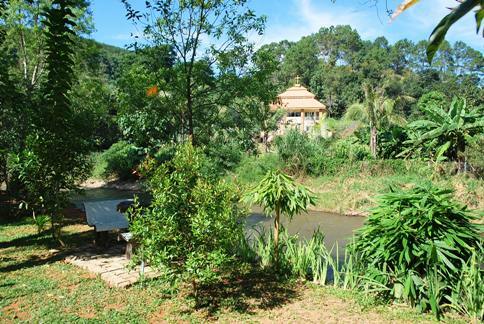 Although the rumor goes that most of the local wealth supposedly has been gathered during the decades, where Ban Hin Taek under Khun Sa’s influence was a hub for the drug trade in the Golden Triangle, it still becomes obvious that the place also has a rich diversity of other agricultural products: besides a variety o local agricultural crops, herbs and fruits, whose English names, if any, are unknown to me, Ban Hin Taek traditionally produces large amounts of Tomatoes, corn, onions, garlic, potatoes, and different types of fruit, all these enjoying a repution for their particularly high quality. To these adds tea, though having been added to the portfolio only more recently. In addition, the local market reflects an extensive, mostly legal cross-border trade with products from Thailand, Burma (today: Myanmar) and China, a further source of Ban Hin Taek’s comparably high level of prosperity. 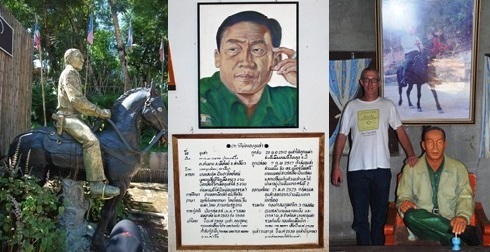 Further, it becomes obvious that Khun Sa, generally a rather controversial figure, who is revered as a hero by some and considered as an unscrupulous criminal by others, did not only bring bad things to Ban Hin Taek, but had gained the reputation of a local benefactor by financing schools, health centers and other publich facilities. 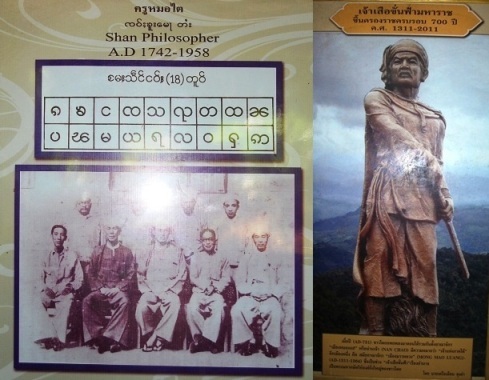 With the local population, he had even earned being referred to as “chao oo”, meaning “father” in the Shan language. The religious pattern of the place also reflects the multicultural and multi-ethnic character of the same: besides Buddhist temples, mostly built in Shan style, there is also a Mosque to be found here, as well a large Chinese temple as well as a church built and operated by Christian missionaries, with the latter probably being rather less representative of the native population’s cultural roots. To these add the animist beliefs of the local mountain tribes, namely the Akha, Muser (Lahu), Yao, Lisor, Hmong (Meo). 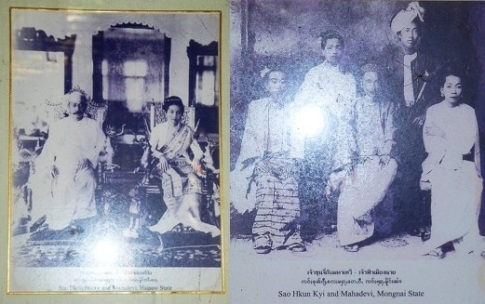 Khun Sa’s heritage is a significant influence factor for the social life in Ban Hin Taek until today: many members of the military as well the political wing of the Shan lobbies and interest groups still call this place their home and/or use the town and region as their residence, basis of operation and safe harbor. 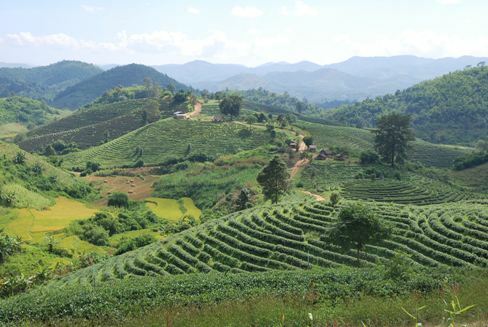 During our exploration of the village and local market on the evening of our arrival, it quickly becomes obvious that the existing tea cultivation in Ban Hin Taek is a clear domain of that part of the population that is of Chinese origin. The question where I can find tea gardens is answered by many with nothing more than a shrug, others are saving face by offering hints with less than vague informational content. A first progress in my tea garden mission is brought about by the operator of our resort, who answers my question for the whereabout of photogenic tea gardens with the advice to follow the dirt road after the local Khun Sa museum. He also shares that the tea gardens I will find there are the property of a Korean, who had dedicated himself to the setup, maintenance and commercial operation of the same until his death in 2012. 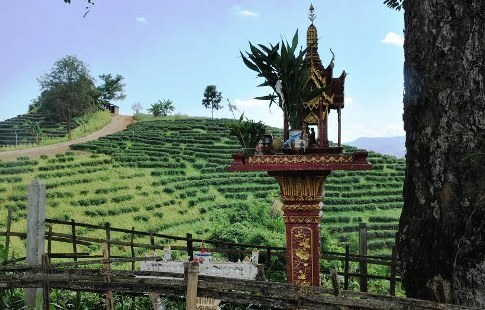 While I – based on the ethnical and cultural diversity of the place – actually had hoped to bump into the production of tea, especially black tea, here that would be outside of the common spectrum of the northern Thai, in particular the Doi Mae Salong tea portfolio, my visits to the local shops and market booths selling tea reveal that besides native, partially still wild growing assamica tea species, which in north Thailand is mainly processed to green and Oolong tea (more rarely: black tea), only the Taiwanese Oolong tea cultivar Jin Xuan No. 12 has found its way to Ban Hin Taek so far. After a failed assassination attempt on Khun Sa planned by the DEA / CIA, the Thai army, under the political pressure of the US as well as for the general benefit of an improved international reputation regarding Thailand’s role in the international drug trade, in January 1982 started a military offensive on Ban Hin Taek that finally resulted in the expulsion of Khun Sa and its army to a place on the far side of the Burmese border. In spite of Khun Sa’s only 6-years-long prevalence over the region on this side of the border, his funeral was held here in the form of an extensive ceremony after his death in 2007 in Yangon, Burma. 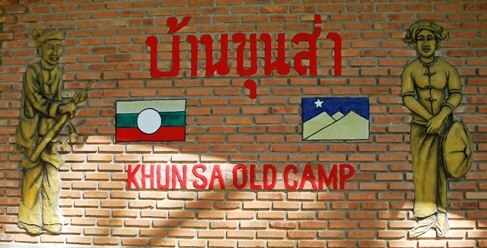 Subsequently, the residence and army camp of the former war and drug lord were turned into a museum, the so-called Khun Sa Museum. 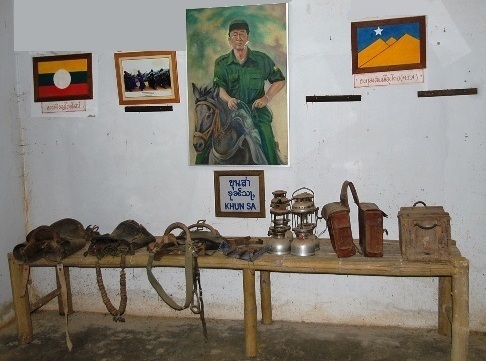 The rather unreflected presentation of the former army camp’s premises, a long sequence of picture and text panels, where – besides the Shan culture and tradition in general – the life of Khun Sa and his political and military struggle for an independent Shan State is being depicted in a completely uncritical fashion, and a collection of personal items of the once-so-mighty Shan leader suggest that the operators of the museum, barely financed from visitors’ donations are most probably former followers and/or admirers of the deceased. Though I perceive the exhibits, in particular those depicting the history of the Shan people and their Royal dynasties, altogether as very interesting, most of it would not has revealed its informational content to us without the interpretation efforts of our guide, the said Shan representative who had helped us to being considered as worth of being given a room upon our arrival at Ban Hin Taek. It is obvious that the museum doesn’t receive much or any support or promotion from official Thai side, which is rather sad, given the rich historical potential of the museum’s theme. What is missing, is tourist infrastructure, English (or any) texts to comment and explain the picture and building exhibits as well as obviously enough also cleaning and maintenance forces for the same and the facility as a whole. We explain our plan to follow said dirt road in order to reach the said tea gardens to our guide and ask her for the details of the way, which she readily explains to us, though clearly indicating her unwillingness to accompany us there at the same time. For reasons, that are evading our understanding and that might be related to the different political and military groups operating in the area, we are also cautioned of visiting a village that supposedly will also be reached via that dirt path. Though we are not aware of any particular dangers we would encounter there, we still discard the idea visiting said village, not least because the exact line of the border is by no means visibly defined in this area and following a dirt path like this that doesn’t represent an official road by any means definitely would involve the risk to find ourselves on Burmese territory all over sudden, a risk we are not willing to take for a whole bunch of good reasons. On the map, the distance from Ban Hin Taek to the Burma border measures only about 3 km. Actually, at this point I didn’t really believe anymore to find anything from the world of tea here that would be worth seeing, but this time I should be disappointed in a pleasant way: already after about 2 kilometers on the extremely rugged and bumpy dirt road, the first tea gardens come into sight. Based on the information that the Korean owner and operator of these tea gardens had died about a year ago, I had expected a certain degree of overgrowth and decay. This, however, is not the case. Whoever has accepted the inheritance of the previous owner, proves to be worthy of the same: the tea gardens are in an excellently maintained condition, and the further we progress into the area occupied by them, the more they reveal their outstanding aesthetic qualities. Repeatedly, we encounter groups of working people busy with various agricultural activities. 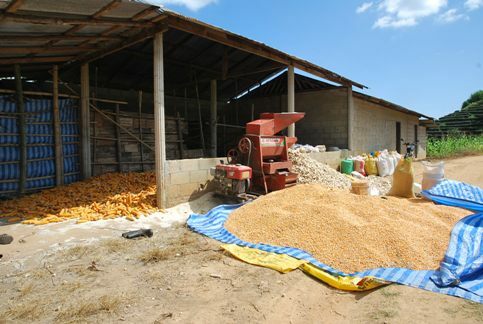 It seems to be the time of the corn crop harvest. 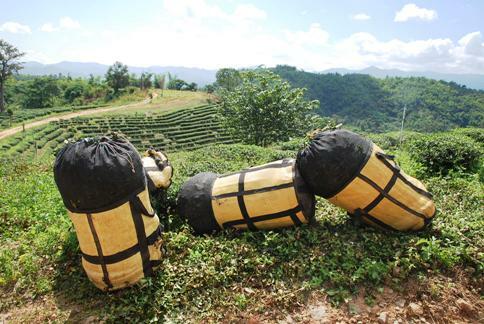 However, also the annual tea harvesting cycle has not yet come to an end at this time of the year, in early November. Evidence for this is provided by bales of freshly harvested tea leaves that are waiting at the roadside to be transported to the tea factory. By the end of this month then, the tea plants will begin their winter break, in which they will remain until March, when they will shoot the first young buds again. However, the most magnificent tea garden panorama opens up to us only towards the end of this extremely spacious tea plantation. Only here it becomes really clear how much love, passion and vision have been invested into this undertaking. The whole plantation is finally crowned by a Chinese (or Korean?) style monument, whose meaning however won’t reveal itself to us. I express my suspicion that this could be the tomb of the deceased Korean owner, a theory that so far could neither be confirmed nor refuted. From here, the way is widely overgrown with grass, shrubs and thorns, and, of course, we suffer our good share of minor injuries from the letter, when still trying driving further, driven by the curiosity about what crossing the next hilltop will reveal. Given the road’s nearly impassable condition, and remembering the warnings we received on our starting point as well as our own all to justified concern that we could just as well in fact already be on Burmese soil, we finally give up and turn. On our way back from the tea gardens to the Khun Sa Museum’s compound and to town, we stop at a facility that had caught our attention on our way there and that we had deemed to be some kind of school in the first place. As it turns out, though, it is much rather the past (and presence?) of opium cultivation and drug trade in this part of the Golden Triangle that casts its shadow here. The facility is in fact a drug addict rehabilitation center, established and run by a dedicated Christian organization. As a stuff member explains, the relevance of such facility is by no means just a relict of the past: even today, the inaccessible terrains on the far side of the border accommodate plenty of drug labs, where besides the “traditional” processing of opium to heroin, especially modern amphetamine, metamphetamine and other chemical drugs are produced, with in particular members of the younger generation only all too often falling victim to them. 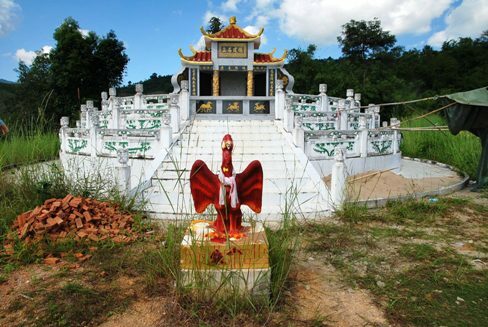 As chance has it, the local temple festival of Ban Hin Taek with the highest significance falls just on the weekend of our visit there. The occasion is the once year held sanctification of the Buddhist monk’s robes and/or the garment used to produced the same. The high significance the Buddhist community attributes to this ritual becomes obvious from the fact that a group of Buddhist monks from Bhutan has been flown in specifically or the performance of the ceremony. For the supporting entertainment program, presentations of local music and dance groups (picture: Buddhist monks from Bhutan at the performance of the robe sanctification ceremony / performance of the Shan “peacock dance”). The next morning, we already have to say good-bye to Ban Hin Taek and carry on with our journey for some duties at Doi Mae Salong. Leaving town, I discover other, smaller patches of tea gardens here and there that inspire my curiosity anew. 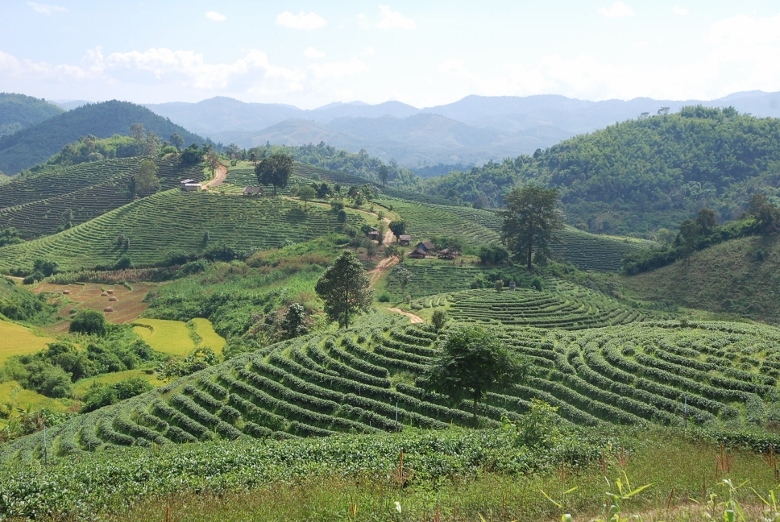 Even if Ban Hin Taek might not be of any central importance for the tea cultivation and production in north Thailand, I don’t believe that I have really managed to explore the relevant possibilities of this place regarding tea to its full or even to a satisfactory extent. 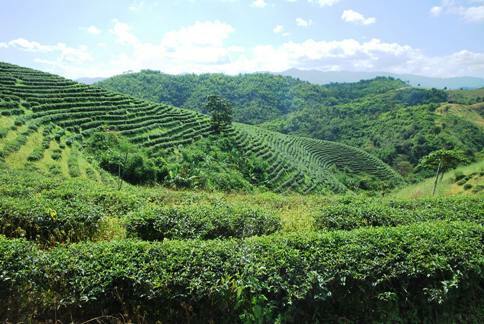 For example, we did not get to visit the local tea factory connected to the tea gardens we have seen. Then, I would also love visiting the surrounding villages of the various mountain tribes once and explore, which particular form of tea culture might be prevalent there respectively, and/or to which kind of tea it relates in individual cases. Also, I had not been able to investigate the possible occurrence of wild tea trees and their exploitation by individual mountain tribes with this visit, a topic that just recently has increasingly drawn my attention to itself. Well, Ban Hin Taek is located only 13 km off my way to Doi Mae Salong, so that an occasion to visit the place and explore the still open questions in more detail will definitely be at hand more often in the future. I am already looking forward to this right now, despite our somewhat problematic introduction to the place on our first night, and of course, before leaving Ban Hin Taek, I have made sure that my next room reservation in the Rim Taan Resort will probably yield more satisfactory results than this time.